Our cute Teddy Combo is an excellent gift for a loved one. 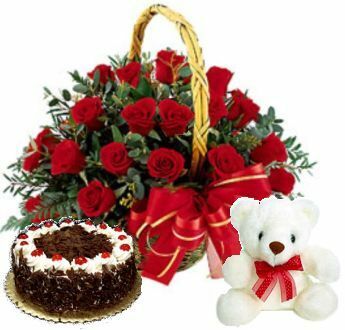 This hamper comprises of a basket of 24 red roses, a cute teddy 10 inches and a delicious cake. Our florist has beautifully arranged the lovely red roses and green leaves in a basket. Send roses bouquet online and let our charming red roses convey your sentiments. Our fresh flowers,cute teddy and the rich delicious Cake will warm anyone’s heart. 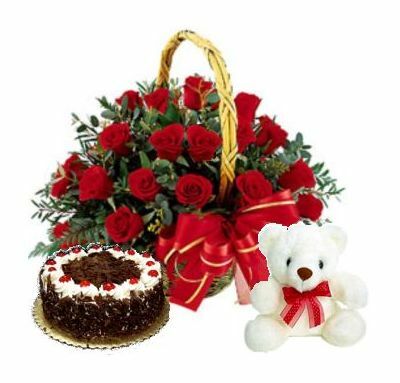 This attractive gift hamper will bring smile on the face of your loved one and will make a wonderful gift on birthdays and anniversary and Valentine’s Day.